There’s a new set of in-ear, wireless Bluetooth earbuds available through an Indiegogo campaign for only $39. The retail price is listed as $149 and they expect to begin shipping in November. Padmate, the manufacturer, sent me a pair for review. The PaMu Scroll earbuds are small, comfortable and provide a better than decent sound. It’s crisp without being tinny and with deep bass notes that never get muddy. Each earbud has a microphone so you can use them with your mobile phone to make or take calls. The microphones provide easy to understand sound as well. The earbuds come in a compact carrying/charging case. Simply plug the included micro USB charging cable into the case, connect it to your computer and the case will charge and then charge the earbuds at least two times before you need to recharge the case. Or you can use the optional wireless charging receiver. Plug the receiver into the case and place it on a wireless charging mat. Padmate also includes four extra foam ear tips and a user manual in the package. 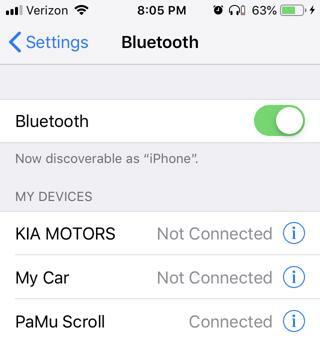 Once the PaMu Scroll earbuds are charged put them in your ears and look for them in the Bluetooth device list on your phone or computer. They will show up as PaMu Scroll. When you’re done using them, simply put them back into the case, there’s no on/off button, they’ll automatically shut down once they’re connected to the charging case. Operation is simple. Simply tap either earbud once to play or pause your music or answer a phone call. Tap twice to activate Siri on an iPhone or decline a phone call. The manual says if you double tap the left earbud it will advance one song in your play list. However I have not been able to get that feature to work. No matter how hard or soft I double tap it always activates Siri when paired with my iPhone. The PaMu Scroll earbuds are equipped with Bluetooth 5.0 and are rated IPX6 water resistant. They have a 3.5 hour play time between charges. They’re available in four different color styles, Rock’n’Roll (brown) Graphene (a graphite type color) Glory Edition (black) and Sakura (white). I’ve been using the PaMu Scroll earbuds for a little over a week and am really enjoying them. I used them on a long road trip and got a full 3.5 hours of solid music listening before they needed a charge. During that time they remained quite comfortable, an important factor and something that I haven’t been able to say about many earbuds or headphones. Phone call quality is excellent too. Even though they have a water resistant rating of IPX6 I haven’t tried them in the shower yet. I only wish they had an independent volume control and that I could get the double tap to advance tracks feature to work. But other than those two minor issues I have been very satisfied. A big part of my job is listening to music and the PaMu Scroll earbuds have become my go-to device for that task. A nice feature that I didn’t see mentioned anywhere is that when paired with an iPhone (and maybe other phones, I’m not sure) you get a headphone icon and battery meter display on your phone. 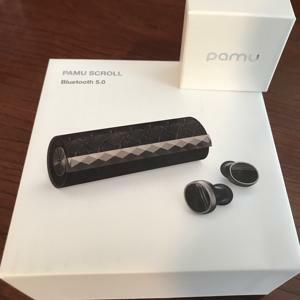 Click here to go to the PaMu Scroll Indiegogo page where you can still (if you hurry) get them for $39, after that the price jumps to $149, but even at the full retail price those little earbuds are a solid deal. Find out more about about them on the Padmate website here.